Knowing where people in need could be in a crisis situation is as crucial as it is difficult. 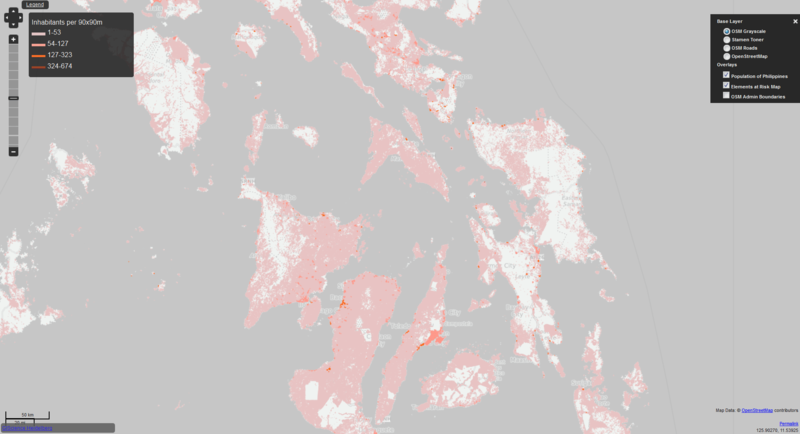 Sometimes the difficulty is just not having a convenient way to display or access extant datasources.As a service to the crisis mappers we supply a Tile Service showing the residential population distribution in the Philipines in 90m resolution. The data are from the AsiaPop project, for details see the notes.The tiles can be used to quickly see where there are population centres that are not well mapped, for example. They can be overlaid over existing other tile services easily, for instructions see below. Population density data visualized with colors from light pink to dark red. Also now available is an ‘Elements at Risk’ layer. The Elements at Risk layer contains information about critical elements at risk (e.g. 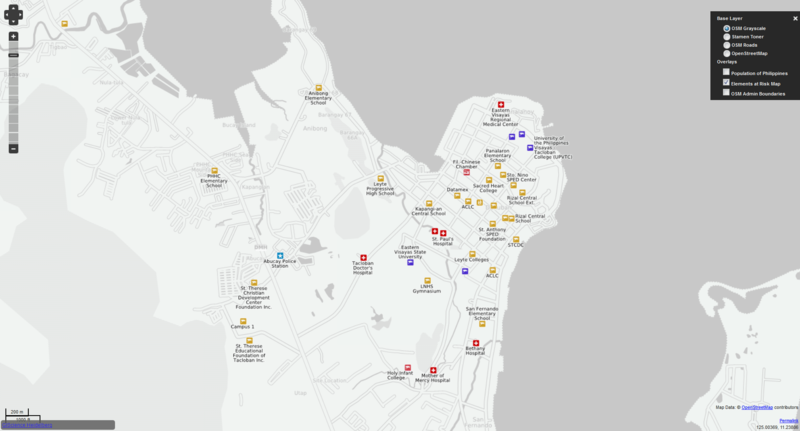 schools, hospitals etc.) and is fundamental to support response activities. It is derived from a data model developed by the AGORA group (http://www.agora.icmc.usp.br) of GIScience Heidelberg and the University of Sao Paulo/Brazil for leveraging OpenStreetMaps (OSM) to automatically identify hazard-specific elements at risk. The data model is based on well-established risk assessment methodologies and aggregates the most important OSM tags for enabling quick identification of the most critical entities that are mapped in OSM. More details on the approach can be found at: http://www.agora.icmc.usp.br/site/?p=389 . The production of the AsiaPop spatial datasets principally follows the methodologies outlined in Linard et al (2012), Tatem et al (2007) and Linard et al. (2010). *changes: Reprojected (EPSG:3857 using ESRI’s Auxiliary Sphere Mercator from the original WGS84, UTM 51) and vectorized Population Distribution by Land Cover. During vectorization some raster cells were changed in shape to triangular forms due to the automated process.Classes created with Jenk’s Natural Breaks with an added class for zero population within a given cell. These are zero and not ‘no-data’ in the original dataset.